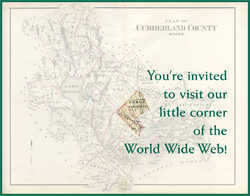 Welcome to Cumberland and North Yarmouth’s website – we’re glad you found us! Ancient North Yarmouth, the original 1680 plantation in the Province of Maine, spawned seven towns including Cumberland and North Yarmouth; two towns that share a common history with deep roots, separate but, in many ways, similar. The towns split in 1821, but joined together again to form the local school district in 1966. In 2006, the schools were linked by a sidewalk that connects the school in North Yarmouth with the school campus in Cumberland. Such connections continue to take on great significance in weaving together the social fabric of the communities. We hope you will enjoy reading more about our towns. In these exhibits we delve into specific areas of how we came to be the communities we are today. These web pages are intended to be the beginning of a process where we create and share more stories about our past with you, so we all can gain a deeper understanding and appreciation for our neighbors. In addition to sharing Cumberland’s and North Yarmouth’s history with the world, we hope to instill in the next generation an understanding of the past and a passion for local history. Greely Middle School has been an active and willing partner on this project, and we hope to continue working with area students to create more exhibits. It’s a win-win situation as they learn to express the stories of our towns’ past while broadening the amount of material available on the World Wide Web. We welcome your input. Please contact us with any information, pictures, artifacts, or items you have that relate to Cumberland’s and/or North Yarmouth’s past, so you can help us share our towns’ story with the world. Enjoy the site!